The Acura MDX is a seven-passenger crossover SUV, one of the more successful and profitable models offered by Honda’s premium make. A prototype of the 2014 model was released at the 2013 North American International Auto Show in Detroit in January, offering what Acura describes as a "strong direction" for what its third generation crossover will offer when it is released later this year. The next generation Acura MDX features an "aero sculpture" or an exterior design that is clean, uncluttered and unpretentiously luxurious. From the front, "jewel eye" LED headlights offer an unmistakably rich appearance, accenting the MDX’s handsome grille. Acura says that the new model is 16 percent slippier than the current edition, an aerodynamic improvement that will help boost fuel economy. The new model also stands in slightly lower than the current edition, with 1.5 inches shaved from its roofline. The wheelbase has been increased by a few inches to provide improved second row seating room and easier access to the third row. Acura says that the 2014 MDX is more rigid and lighter than the 2013 model, benefiting from a new suspension system that also provides improved handling. Under the hood, an all-new direct injection 3.5-liter V-6 engine with variable cylinder management powers this SUV, offering improvements in horsepower and torque. Big for 2014 will be a number of safety improvements. The Acura MDX has long been a leader in all things passenger safety, but the new model will raise the bar further. Besides its stronger body structure, the Acura MDX will offer both forward collision warning and lane departure warning systems, and update what it calls its "visibility technologies" that provide blind spot intervention, lane keeping assist and active cruise control. The focal points of the changes is a multi-angle rearview camera that makes it possible for drivers to see an even wider area around the rear of the vehicle. Inside, the MDX’s telematics system will receive an important upgrade as the next generation of AcuraLink rolls out. This cloud-based connection system makes it possible to bring in personalized news reports, SMS text messaging, SiriusXM satellite radio, Pandora radio connectivity while also providing ease of smartphone connectivity. An upgraded audio system will also be available and concierge services will include live person support. 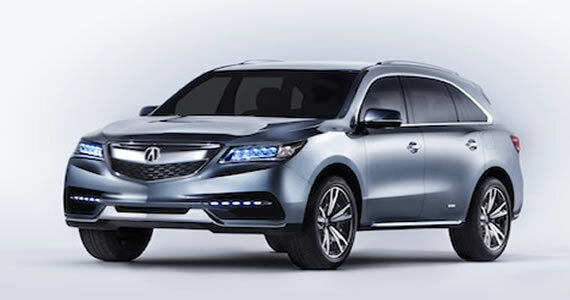 Not much else about the 2014 Acura MDX has been released although true to Honda Motor America practice, the prototype should be a near perfect representation of the production version. Honda may like to surprise its customers, but when it comes to design you’re usually seeing what you will get. The new 3.5-liter V-6 engine comes in slightly smaller than the outgoing engine. This single overhead cam engine is expected to make about 310 horsepower and 265 foot-pounds of torque, or the same as the current model, but do so more efficiently. With a lighter weight underneath and the right transmission pairing in place, the 2014 Acura MDX just may move to the top of the segment. Front-wheel-drive is standard, all-wheel-drive is optional. The latter features Acura’s acclaimed Super Handling system that provides for optimum handling and control under a variety of road conditions. Bringing the Acura MDX to the market later this summer is important for Honda’s premium brand. Acura sales rose by 26.7 percent in 2012, for its best year since 2007. Acura has long lived in the shadow of its Japanese competitors, namely Lexus and Infiniti, but the good money is betting that the MDX and other planned products will vault the brand in the coming years. Jonathan Allbones is a personal finance writer and car fan. He contributes to a number of leading blogs across the web. If you are looking for a car supermarket visit The Car People.